Quilting in My Pyjamas: Whoooooo Hooooooo! For anyone who doesn't have their mojo at the moment, I think it's at my house and by the way - I'm keeping it. I started this quilt in September with a huge amount of gusto and enthusiasm. I stole the idea from Thea who was working on her own hourglass quilt at the time. I loved how hers was turning out . She managed to finish hers in November. You know when you see a quilt and think "I have the perfect fabric for that in my stash " and cant wait to start? That's what happened to me. Along the way I made a mistake and kind of gave up on this quilt and it lurked in my unfinished pile ...and kept lurking .. and in the end it was thumbing it's nose at me and screaming "You're never going to finish me loser ". It was in good company - there were plenty of other quilts there to keep it company. At one point they were all yelling at me like an out of control football crowd. But as part of my "I gotta finish my WIP's" vow I dragged it out last month and now it's finished. I was kinda hoping for a May finish but I'll take June. I'm in love with this quilt and it's staying right here. 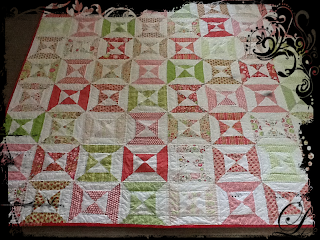 Miss P snaffled the jelly roll race quilt on Monday for her place so I have room! I'm open to suggestions for names. I'm so crap at giving my quilts names. I'm hoping for two more finishes in June. I have a gorgeous project lined up in my head to start in July if I can pull two finishes off this month. And maybe if I can finish some more stuff I can write a decent blog post again ! It is beautiful! Hour glass...hhmmmm....Marilyn Monroe comes to mind straight away. I say call it Marilyn. The Missus says Marilyn Monroe. Gorgeous. And I love the back too, great contrast. Very pretty! Congrats on another finish. 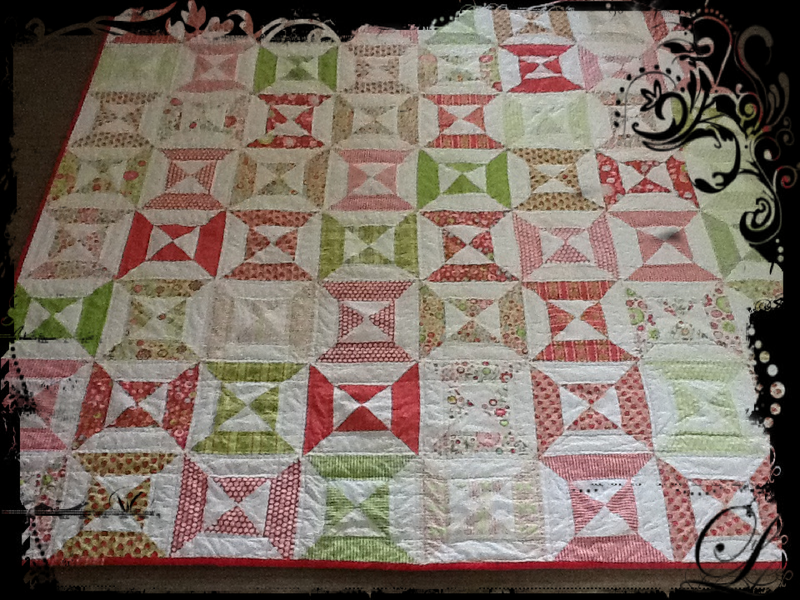 Since you got the idea for the quilt from Thea, how about "On California Time" or "California Spring Time" since her blog is California Dreamin'. Well look at you! I really think this quilt would look lovely in my home, so let me know if you change your mind on keeping it and I'll give you my address. :o) Then you could name it, "The One That Got Away". That's very pretty! I can't name your quilt, because then it would be mine......you have to name your own quilts yourself, you know. It's beautiful! way to go for finishing it. For me, I'm thinking a play on words to name it (I always think like this). Hours in the Day. which is my top choice b/c i think it represents the design name plus the days to make it... reminds me of the fact that each day is made up of hours and you just have to move from one to the next and sometimes the individual components (hours) are tedious but the overall (quilt) is worth it. Or something more playful Hourly Daydreams. I don't know... I always think names are such a personal touch. Sorry. I love the quilt, though! Oh! If whoever names the quilt, keeps the quilt, as Jennifer has said, why haven't you mailed me the "When Pastels Turn Sad" quilt? So THAT'S where my mojo went? And I've been looking for it all this time... I didn't know it went all the way down under! Can you send a smidge of it back??? What an amazing quilt! Absolutely beautiful. Very pretty and I love the pieced back. That is one gorgeous quilt, lady! How about "It's About Time" since it had to wait on you and your mojo for its finish? Whatever you name it, it's really lovely. Oh my goodness Shay, that is gorgeous!! Yay for a finish!! And such a beautiful one at that. Name for the hourglass?? How about "waiting for summer"? This is beautiful. I'm awful at names too. Good luck. I've been looking for my mojo for weeks. Glad to know it's with you. I haven't even read a blog in about 2 weeks. I love the quilt, great colors. Congratulations on the finish. First name that came to my mind is Strawberry Summer, but maybe Pink Lemonade. Whatever name you choose for it, it's a beautiful quilt! Your hourglass looks like Happy Hours, or Happily Ours - since you are going to keep it. I love the colors! You did a good job on it. First, I want to say that I got the idea/pattern from Cluck Cluck Sew. http://www.cluckclucksew.com/2009/09/tutorial-double-hourglass-blocks-easy.html. just to give credit where credit is due. Second, mine isn't finished, just the top. Third, yours is beautiful! absolutely gorgeous. I'm glad you're keeping it at home too. Always nice to keep favorites around. p.s. I like "keeping time"
Ah very pretty n girls.. I am enjoying some some pink here at present but could do with a smidge of your "finishing mojo" please! And now your telling me that I have to come up with clever names for my quilts AND yours &#%*! I am so original I would call it pink hourglass so I am as as helpfully and sad as a quilter stuck in a Moda warehouse without her mojo! I'm too knackered after FQR to be looking after my mojo right now, so I hope you're taking good care of it! Lovely quilt Shay and some great suggestions for names too. I rather like "Marilyn" for lateral thinking. A pat on the back to you Mrs PJ. Another nice finish may June continue to be fruitful. The quilt is beautiful. I love the colors. You always do great work! My mojo has been missing, but it is not because it is in the Land of Oz. If you would be willing to send some mojo over on the next flight, I would appreciate it! so pretty so pretty so pretty ... congratulations to you and your major mojo !!! How about "Girl Time" or "Time for Pink" - probably too tame for the likes of you! It is gorgeous! Simply gorgeous Shay. I think all the good names have already been said. Have fun choosing one or coming up with one of your own. Looks pretty good Mrs P, sorry can't think of any names I struggle with names of my stuff, so I'm not about to share any good ideas with you lol just in case I need them. OOOHHH This quilt is gorgeous!! It's so pretty, and girly and fun. And it's finished!!! I'm trying to think of a wonderful name but my brain has stopped working. She sure is a great way to start June. Love the incentive you have for some more finishes this month. Your quilt is very pretty and finished just in time for snuggling underneath - Enjoy. 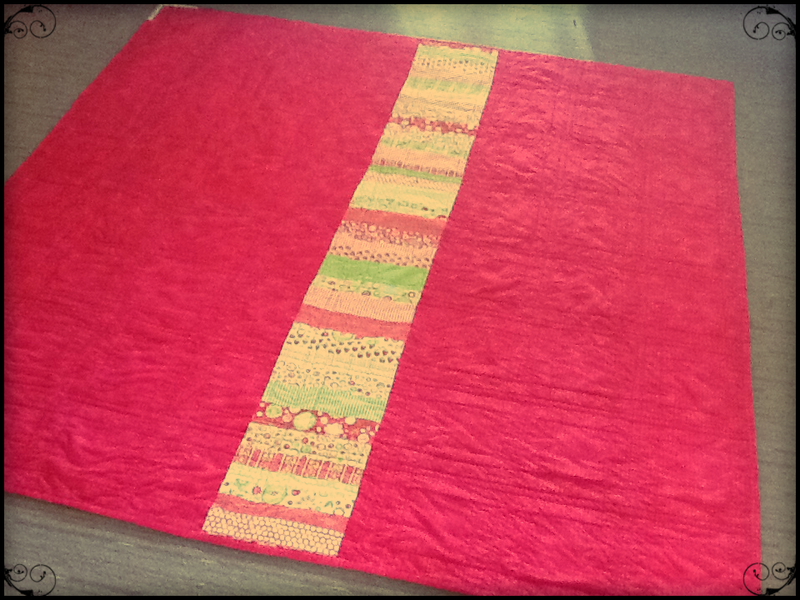 I thought we were calling this one the Strawberry Shortcake quilt. I love how it came out. You did a really great job with it. And I totally know what you mean about seeing something and going "I have the perfect fabric for that." I'm currently working on one of those. It has sucked all desire out of me to finish anything else. What was I thinking? Anyway, awesome quilt! Congrats on kicking your WIP list squarely in the bum.